Here are a some lovely photos from the wedding fair at Carlton Towers. This years Mother’s Day Window is clean and sharp, we have beautiful gifts for all budgets, from candles, reed diffusers, fresh planters in luxury pots. And with the launch of our new website we have a fantastic range of fresh flowers. Come take a look. Feeling the excitement of the forthcoming wedding, our theme this month is one of more a patriotic Window. A celebration of Prince Harry and Megan’s wedding..
We have lots of new products from our New range of ‘Powder’ socks and stunning slides and brooches, to fun swinging birds. Easter wouldn’t be the same without charbonnel et walker truffles and chocolate selections in special spring time boxes. Lots of spring flowers are now in stock, so even if it’s still a bit dull outside you can enjoy the springtime inside with some luxury bunches. We’re on cloud nine this year with our 2018 Mother’s Day Window, inspired by the thought of ‘come rain or shine’ our mum’s help us and guide us though life. Even if it’s a ‘Mum’ figure to celebrate this day with we are sending flowers all of Mother’s Day weekend. Lisa is preparing her planters this year we have the return of the handbag planter which was very popular. And we have some fantastic gifts that have just arrived. Plus our Charbonnel et walker truffles which are so yummy. We at Lisas florist are very proud of our store, this year we have a fantastic range of gifts including candles, reed diffuser’s, Jellycat soft toys. Christmas decorations, garlands and door wreaths. Aswell as our lovely range of fresh flowers and seasonal foliage, which we can make fresh hand tied bunches or arrangements with. We also stock fresh door wreaths. Grave wreaths for our loved ones that are not hear to share Christmas with anymore. 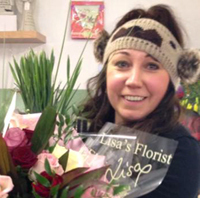 So from all at Lisas Florist Selby we wish you all a Very Merry Christmas and a Happy New Year. In Spring I had an unexpected phone call from a lady in Church Fenton, who was looking for tradional funeral chaplets. I explained that both myself and Lisa had been taught the tradional ways and that although these methods are only used at Christmas time now for wreaths it is most definitely not a lost trade within the older florists. Later in the conversation it was revealed that the funeral work of chaplets and Laurel garlanding was to be featured on the ITV series Victoria. As I was already a fan of the show, as you can imagine I was very excited. Both myself and Lisa had a meeting with Art Director Micheal Howells on the set of Victoria just down the road from Selby at Yorkshire Screen’s new film studio in Church Fenton. The old air hanger now contains the main areas of Buckingham palace. After our meeting in the hub of the Art directors work room we were taken by Michael to look around the set. Firstly we met the creative people making props, curtains, and a full buffet.. And then we were not disappointed starting the tour in the main airhanger beneath the main halls in the servants areas, boot room, under the stair, then Micheal led us upstairs to reveal the stunning walk of the beautiful corridor, Axminster carpets, fully working fires and gilded statues. The chandlers sparked in the light…truly breathtaking. We walked down to the ballroom where music was playing as cast members were practicing there waltz… and then to Victoria boudoir which had just been redone for the second series. 2500 hand covered buttons hold the silk to the walls of the room. Beautiful drapes gave this room the luxury feel…I glanced at the writing table to see the specially selected writing equipment and paper. The attention to detail was totally amazing. Returning to the works van a little shell Both Lisa and myself hoped that we would get the contract and later we found we did. Just to be one tiny part in Mammoth Screen’s film production would be very exciting. Lots of planning started, as Micheal’s eye for the greatest detail became our creation. Season 2, episode 2 revealed our hard work in a 30 second airing both in the lying of state scene and in the church. All the sweat getting the wreath on the chandelier in the church was totally crazy but the experience of been on location at Allerton Castle and Allerton Church was unforgettable. Both myself and Lisa had great fun. A few weeks later we did another funeral which has yet to be screened.